We are leading bespoke water and light fountain experts with over 70 years of experience. Our family-run company spans three generations and we have gone on to become an exclusive music fountains manufacturer. A commitment to excellence has resulted in an unbeatable level of reliability and quality, with our family name depending on us maintaining high standards. A bespoke water and light fountain is guaranteed to benefit your business by bringing in crowds to marvel at the mesmerising display. Since they incorporate the latest space-age technology, our fountains are incredibly bright any time of day and require very little maintenance, allowing them to run for years. Each bespoke system is tailored to your needs and will quickly become a popular local attraction that adds value to your business. Our displays can be seen all around the world and we have had the pleasure of working with many large parks such as SeaWorld, Disney and Universal Studios. Water and light fountains can be both graceful and exciting, depending on your specific requirements and will never miss a beat. As far as entertainment value for money, it does not get any better than a musical fountain spectacular. Customers pay to see these shows, leading to our clients generating capital by charging an admission fee. We offer self-standing solutions that benefit virtually any venue that serves the public, either indoor or outdoor. Fountains are designed to dance perfectly in sync to music. to create a memorable experience that captivates your audience and totally transform the venue. Choose from a wide range of colour, routine and installation options. Most common are those in pools, however our fountains can be set on platforms, floating (on lakes or barges) or self-supporting structures. An outdoor bespoke water and light fountain offers many advantages as they have the potential for greater height and they are in pleasant natural surroundings. 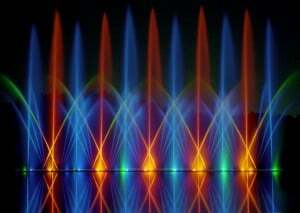 Liquid Fireworks are more than happy to help any clients looking to book a bespoke water and light fountain. Simply call us on (239) 574-5181 or email at sales@liquidfireworks.com to speak to a member of our experienced team.